Home>News>National Jockeys Trust Raceday - Saturday 25 May at Flemington! We're delighted to host our annual Melbourne fundraising luncheon at Flemington Racecourse. 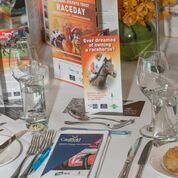 Presented by TAB, it will be held in the exclusive Committee Room on National Jockeys Trust Raceday, Saturday 25 May 2019.